In the weeks leading up to the Eighth Annual Texas Community Music Festival, we will be spotlighting some of the ensembles that will be participating in this year’s program. The Hill Country Community Band of Marble Falls will be performing on the opening day of the festival, Saturday, April 20 at 12:15, at Central Market North. The Hill Country Community Band of Marble Falls has been performing for over 20 years. Members drive from all over the Hill Country to meet at the First United Methodist church in Marble Falls where rehearsals are held at 7:00 p.m. every Thursday. 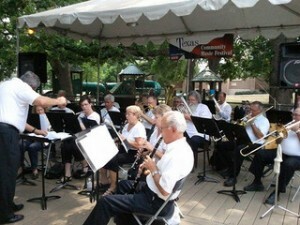 Band members range from age 17 to their 70’s and many have performed professionally. New members are always welcome and may contact Joe Mantheiy at mantheiy@tstar.net or (830)385-3641 for more information. The band regularly performs throughout the region for charitable and civic organizations and looks forward to participating in the Texas Community Music Festival every year.